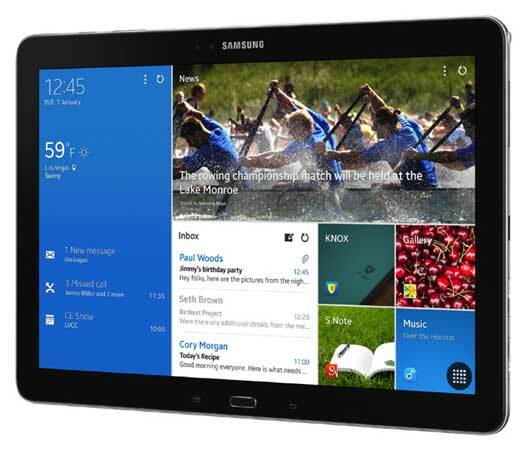 The Samsung Galaxy NotePRO, which was announced at the recent CES 2014, has now been officially launched in India. It is worthwhile to note that this is the biggest Android tablet from the company. The Samsung Galaxy NotePRO has a 12.2 inch display with high resolution of 2560 x 1600 pixels with 16:10 aspect Super Clear LCD display. The device, which will be available in the Indian market, is powered by the true octa core Exynos 5 Octa processor clocked at 1.9 GHz and has only 3G support. The device packs in 3 GB of RAM with storage options of 32 GB or 64 GB. The Samsung Galaxy NotePRO has a similar faux leather back with stitching accents that was seen in the Note 3 along with the S-Pen stylus. The tablet has a rear facing 8 MP camera and a front facing 2 MP camera. The device runs on the latest Android 4.4 KitKat with Samsung new Magazine UX. There is also a massive 9500 mAh battery, which is said to last for at least 10 hours on continuous usage. The tablet is priced at Rs. 64900.